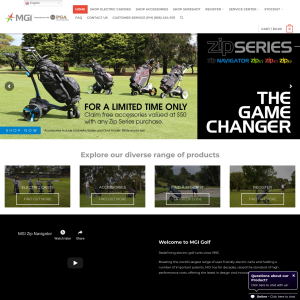 Simply enter your details to go in the running to win 1 of 3 Christmas hampers from MGI Golf! Optional: to increase your chances of winning, write us a Google or Facebook review for an additional 10 bonus entries each. The Promoter is MGI Golf, 9-11 Maurice Court, Nunawading VIC 3131 (ABN 59 006 140 101). Entry is open to Australian Residents. The promotion commences 12:00pm Wednesday 5th December 2018 and concludes 11:59pm Sunday 16th December 2018 ("Promotional Period"). To enter the competition participants must complete the entry form at http://mgigolf.com/christmas-giveaway/ and include their name and email where indicated to enter the draw. 20 bonus entries will be awarded to entrants who leave a Google review or Facebook review of MGI Golf. Entries will be deemed to be accepted at the time of receipt and not at the time of transmission. Incomplete, inaudible or incomprehensible entries will be deemed invalid. No responsibility will be taken for lost, late or misdirected entries. For all draws - Entries close 11:59pm Sunday 16th December 2018. Draws will take place on Monday 17th December. All draws will take place at MGI Golf offices – winners will be selected randomly from the order in which all entries were received by using a random number generator. All winners will be notified by email and may have their name published on MGI Golfs social media accounts. Total maximum prize pool is valued at $1,500 (inc. GST). Prizes will be distributed by mail. Where winners are reachable and readily identifiable their prizes will be distributed within 28 days after the draw. The Promoter reserves the right to validate and check the authenticity of any prize claim or entry before awarding a prize.